The world of gluten-free beer is becoming more competitive every day. As people realize the benefits of eating and drinking gluten-free, and as more gluten-free options become available, the competition has begun to heat up. 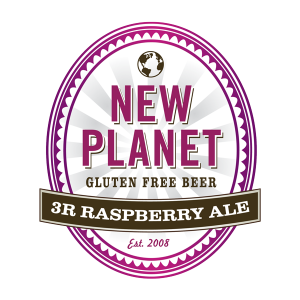 New Planet Beer is excited to announce that 3R Raspberry Ale won GOLD at the Los Angeles International Commercial Beer Competition. This gold medal in the gluten-free beer category comes hot on the heels of 3R Raspberry Ale winning bronze at last year’s Great American Beer Festival. It looks like the Natural Oregon Raspberry Puree is a hit! New Planet Beer is dedicated to not only making our beer gluten-free and as healthy as possible, but also making sure that it tastes great. Thanks to everyone who helped us win this award, especially our fans! New Planet Beer is excited to open it’s first online retail account! Brewforia.com carries all three styles of New Planet Beer – Tread Lightly Ale, 3R Raspberry Ale and Off Grid Pale Ale. Buy a single beer or a 12-pack sampler. The perfect gift for the gluten-free beer drinker or for yourself. Tread Lightly Ale – is a smooth and well-balanced “Pilsner like” style ale with citrus tones and light in body and color. Tread Lightly Ale is made from sorghum and corn extract, orange peel, hops, and yeast.Tread Lightly supports trail restoration. 3R Raspberry Ale – our award winning raspberry fruit ale has just the right balance of fruit flavor and aroma. 3R Raspberry Ale is made from sorghum and corn extract, natural raspberry puree, orange peel, hops, and yeast. ‘3R’ supports Reduce, Reuse, and Recycle – the 3R’s of waste reduction education. Off Grid Pale Ale – is a wonderful interpretation of the classic pale ale style. It has a distinctly deep amber color and great character and body. The three varieties of hops provide a wonderful aroma and a citrus and spicy hop flavor. Made from sorghum and brown rice extract, tapioca maltodextrin, caramel color, molasses, hops, and yeast. Off Grid Pale Ale supports alternative energy efforts. Do you want to try all three beers? Purchase a sampler pack from Brewforia.com. New Planet Beer is pleased to announce our selection of BottleHood as the “Doing Good Things for the Planet” 3R Raspberry Ale 2011 partner. BottleHood is an innovative producer of repurposed glassware based in San Diego, CA with an office in Boulder, Colorado. BottleHood collects wine, liquor and beer (yes actual New Planet Beer bottles from local restaurants like Salt and Happa Sushi) and repurposes them into juice glasses, tumblers, vases, light fixtures and jewelry. “We selected BottleHood because of their direct environment and community impact. The company keeps glass out of local landfills, creates a significant number of local jobs and gives neighborhood retailers the opportunity to sell locally produced products.” said Seneca Murley, New Planet Beer co-founder. The only twist in our selection of BottleHood is that they are a for-profit company, and our grantmaking to date has been aimed at non-profit organizations. New Planet Beer has commissioned BottleHood to take 3R Raspberry bottles and repurposed them into glass tumblers with our logo on it. We are then going to donate the tumblers to Colorado based non-profit organizations for their silent auction fundraisers. Included on our list for donations are Wildlands Restoration Volunteers (who is our Tread Lightly Ale 2010 and 2011 partner), the Colorado Recycling Association, High Country Conservation, EcoCycle and others. The 3 “R’s” in 3R Raspberry Ale stand for Reduce, Reuse and Recycle. Our partnership with BottleHood provides an opportunity for an additional meaning: reclaim, repurpose and reuse. BottleHood’s products can be found online at www.bottlehood.com. BottleHood is offering New Planet Beer Fans a 5% discount (enter NewPlanet into the coupon line on their website). To help New Planet Beer fans toast in the New Year, BottleHood has donated two brown beer glass tumblers to give away to our readers. To win please leave a comment describing how you reduce, reuse or recycle below or on Facebook.